K2's manufacturing process management solutions, intuitive forms, workflows and apps help drive quality and efficiency. Manage and track activities such as preparation of declarations, procedural compliance, collaboration and reporting. Improve product quality, lower costs and reduce risk through pattern recognition, issue identification, triage, resolution and trend reporting. Track, report and automate inventory management with manufacturing workflows, forms and apps to ensure the supply chain continues to run efficiently. Ensure business runs smoothly with manufacturing resource planning solutions that span line-of-business systems and people. In our increasingly fast-paced world of business, manufacturing organisations are turning to technology to stay ahead of the competition and increase efficiency. Everyone from supply chain managers to buyers to material planners can benefit from business process applications. 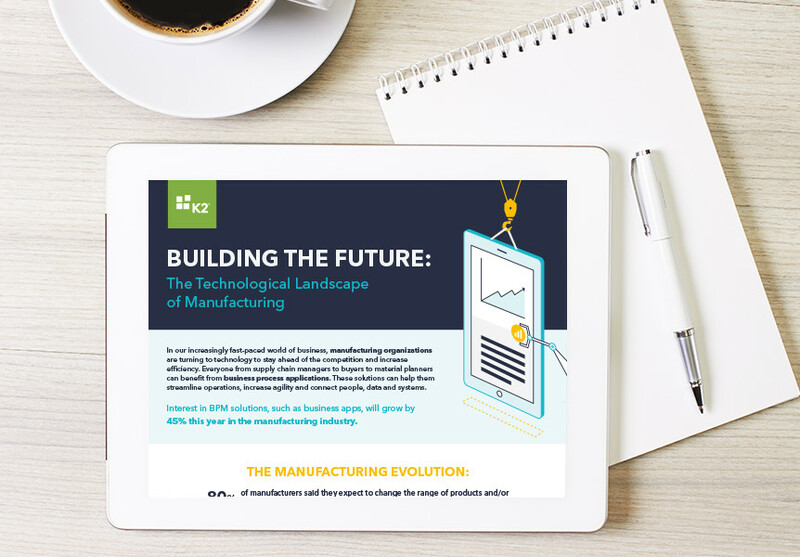 In our infographic, Building the Future: The technological landscape of manufacturing, we look at the evolution of manufacturing and the role technology will play in its future. Understanding the importance of mobile, predictive tools and the impact IT systems can have on productivity will help you future-proof your business. 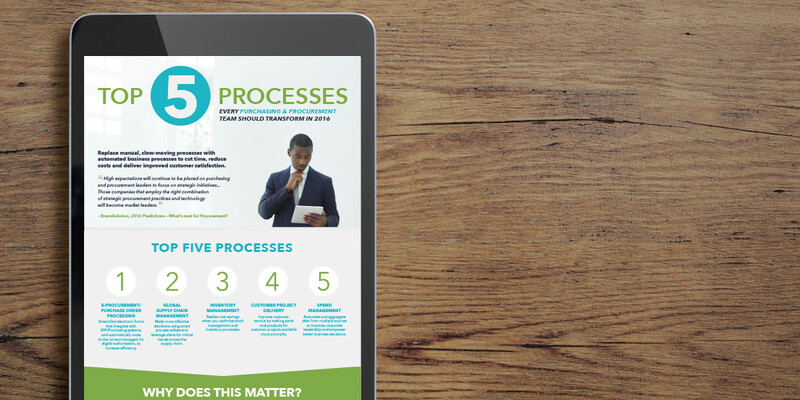 Our infographic shares five purchasing and procurement processes your business can transform to impact success. As a market leader, it’s important to streamline these processes in order to have time for more mission-critical tasks. Want to learn more about future proofing your organisation? Complex processes and opaque workflows cost time, money and customer satisfaction. K2's manufacturing process management solutions, intuitive forms, workflows and apps help people work smarter and get business done faster to drive quality and efficiency. To find out more about K2 and how we can streamline the most challenging manufacturing processes, please click here.